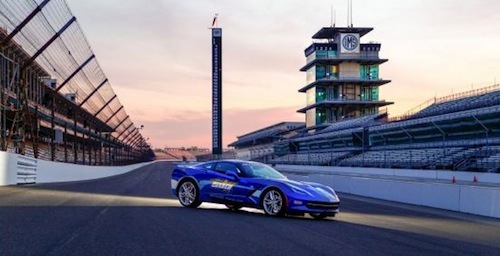 San Francisco 49ers Coach Jim Harbaugh will drive the new 2014 Chevrolet Corvette Stingray Pace Car in the Indianapolis 500 on Sunday as he returns to the NFL city where he played quarterback. San Francisco 49ers Coach Jim Harbaugh, quarterbacked the Indianapolis Colts from 1994-1997 and was a successful player for the NFL franchise. Now he returns to the NFL city and will make a different drive down a much different field as he gets behind the wheel of the new 2014 Chevrolet Corvette Stingray Pace Car in the Indianapolis 500 on Sunday. This time he will drive in front of a field of 33 race cars to start the 97th running of the Indianapolis 500. Harbaugh has been in the spotlight a lot the past few month’s as he took his San Francisco 49ers to the Super Bowl this year. Harbaugh led the team to a 11-4-1 record in the regular season, winning back to back NFC West titles. In the Super bowl, Harbaugh faced his big brother John Harbaugh of the old city where the Colts used to play in Baltimore. He took on his brother and the Baltimore Ravens in Super Bowl XLVII. It was the first time two head coaching brothers met against each other in the Super Bowl. In an exciting game, John Harbaugh and the Ravens won this game with a score of 34-31. The Baltimore Ravens quarterback Joe Flacco was Super Bowl XLVII MVP and received a new 2014 Corvette for getting the honor. The bright red Corvette C7 appeared on the field at the Mercedes-Benz Superdome in New Orleans after the game where Flacco received the keys. Harbaugh is a big racing fan and is no stranger to the IndyCar Series. The football coach is also co-owner of Panther Racing in the IndyCar Series. The main car for the team carries Harbaugh's old jersey number, 4. When the team won the 2001 and 2002 IRL championship, the team, which had the option of going to #1, chose instead to keep the #4 for its association with Harbaugh's career. He has more than his football team as he also fields the two-car, Chevrolet-powered IndyCar team with drivers J.R. Hildebrand and Townsend Bell. Hildebrand will drive the No. 4 National Guard Chevrolet in Indianapolis 500 and Bell will compete in the No. 60 Sunoco “Turbo” Chevrolet. The 2014 Corvette Stingray underwent a complete makeover and at the heart of the new C7, it gets an all-new 6.2L LT1 engine. The new powerplant features advanced technologies including direct fuel injection, continuously variable valve timing and Active Fuel Management, also known as cylinder deactivation, to help produce 455 horsepower more efficiently. The 2014 Corvette Stingray coupe goes on sale this fall, with a convertible model coming a few months later. The 2014 Chevrolet Corvette Stingray coupe will be available later this summer and have a suggested starting retail price of $51,995. Look for the competitive Jim Harbaugh to be behind the wheel of the all-new Laguna Blue 2014 Chevrolet Corvette Stingray Pace Car this Sunday.